We are happy when we remember those days when we were at college, having a great time playing foosball with our friends. A lot of professional players scored their first goal during college, in game rooms on Tornado foosball tables. Today, most tables made for foosball cost more than $500, so if you want to avoid buying them, a great possibility is to download free apps for your smartphone and have a great time. You can find a lot of apps with low graphics and design but playing on that apps can give the user great experience. Before we start with reviews you need to know that is Ludus Studio like Porsche or Buggati in a car company. They are the best company that creates best apps for foosball users. The reason is very simple. They think about everything that is important for one foosball player. Foosball Cup app has different mods game, also have 25 national teams, ability to change the level of difficulty, player layout and table or size. 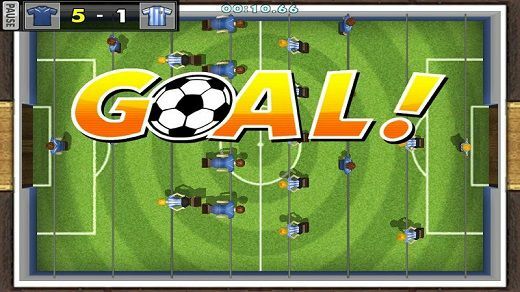 One thing you need to know that Foosball Cup is the first version of foosball game by Ludus studio and it is the best. Now you will find out why. How is it possible that the new version of foosball table app by Ludus Studio is on the second place? It is very simple. Because in newer version you need to play a lot of matches and win to unlock most features that old version already has unlocked. So, a lot of users think that this was a big mistake. Graphic and design in this app are much better and you have 51 national teams to choose from, but that is not enough to be in first place. Let’s Foosball Free – Table Football by Niea Tech Co, Ltd. The third app is Let’s foosball free. This game is in the range of other two games by Ludus Studio. In this game, you have settings where you can change the color of players, view of camera and level of difficulty. The ball moves very smooth and players are easy to control which are great pros of this game. Also known as Foosball 2013, it is not the newest app but it is regularly updated by White Collar Games. The game is very easy to navigate through the menu. You have 2 menus, in 1 menu you need to pick what mode you will play in, and the second menu where you choose gameplay settings. Problem with this game is adjusting the players and speed of the ball. When you adjust you will have a lot of fun. The fifth app is this solid foosball game by Illusion Labs. This game looks like a beta version of foosball games and it needs to make some improvements. A lot of users write about the problem with working of apps and lot fo bugs and glitches so it is not as good as the rest of the list.